Hello, there fantasy friends and foes. Welcome back to the Fantasy Six Pack’s Weekly Drop List. After taking a week off for the All-Star Break (thanks bosses), we are back at it with fantasy advice to get your teams geared up for the second half. It looks to be a fun-filled Trade Deadline with contending teams looking for the missing piece(s) to get them in the playoffs and beyond. 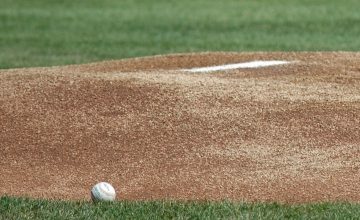 To assist our fantasy fans to get to their playoffs, I came up with three pitchers that won’t help their teams or your fantasy teams reach their championships. Who are these pitchers? Why should I drop them? Find out the answers to those questions and a whole lot more in the 2018 Fantasy Baseball Week 17 Drop List. 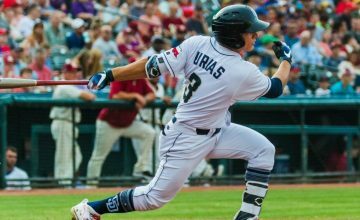 As you are reading who to drop, take a look at who Tyler Gettmann says you should pick up in his 2018 Fantasy Baseball Week 16 Waiver Wire: Unofficial Midway Point. Domingo German has been both Jekyll and Hyde for the Yankees this season. Considering that he is a 24-year-old rookie, that’s not surprising. German made his first major-league start on May 7 against the Cleveland Indians. He pitched six outstanding no-hit innings and struck out nine batters while only allowing two base runners. The Yankees thought that they have found a young gem for the back end of their rotation. German, the Yankees’ fifth starter, has made 13 starts in his 19 appearances this season. He holds a 2-6 record with a 5.68 ERA, 1.32 WHIP resulting into an -0.4 WAR. His biggest issues come via the home run, German has allowed 15 homers already this season. The young pitcher is rough around the edges but has shown promise as evidenced by his 95:32 K: BB ratio. 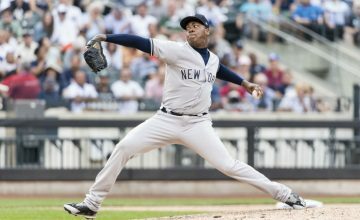 German has not been the answer to the Yankees’ starting pitching woes this season. Actually, he is part of the problem. German has yet to post an ERA below 5.00 in any one month and is a disaster to start games. The rookie right-hander has a first-inning ERA of 9.00 in his 13 starts. Unfortunately, it doesn’t get that much better as the game continues. He holds a 6.92 ERA in 2nd innings but then records a 2.77 ERA in 3rd innings. Domingo German was just optioned to Triple-A, and it’s doubtful that he will regain a spot in the rotation. With the Yankees desperately looking for starting pitching, his days as a starter are definitely numbered. His only option to return this season is as a possible long-man out of the bullpen. In either case, any hope of being a fantasy contributor on a strong Yankees team has vanished. In the past year, Ken Giles has gone from the closer for the World Champion Houston Astros to being sent to Triple-A after another pitching and personal meltdown. 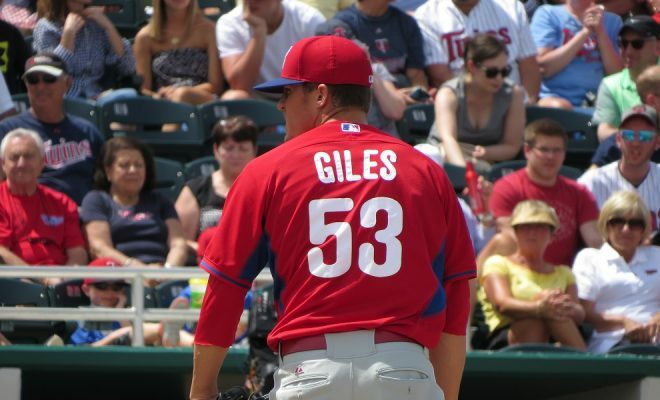 Giles was demoted to Triple-A after a horrible outing on July 10. Giles then proceeded to lose his cool after Manager AJ Hinch pulled him from that game. He has been pitching in Triple-A Fresno since and it really doesn’t look like there is much hope that he will be pitching for the Astros again this season. Giles was excellent in converting 34 of 38 saves along with a 2.30 ERA during the 2017 regular season. Then during the 2017 postseason, the wheels started to come off. The right-hander pitched in seven postseason games and gave up runs in six of them. He blew a critical save in game four against the Yankees, blew a two-run lead in the 10th innings in game 2 against the Dodgers and lost game four against the Dodgers. He then spent the last three games of the World Series nailed to the bench as the Astros won the championship without him. Overall, he did have some success this season. He is 12 for 12 in save situations and has yet to give up a run in any of those outings. However, every other time he has been on the mound he has been a disaster. He has posted an ugly 8.20 ERA in 18.2 innings pitched. Similar to the Astros forgetting about Ken Giles closing games for them, fantasy owners should forget about Giles on their fantasy rosters. Luke Weaver has had a rollercoaster 2018 season. Weaver went 5-8 with a 4.72 ERA, 1.32 WHIP and 8.4 K/9 in his 19 starts in the first half. He battled inconsistency throughout. He allowed four more earned runs in eight of his first 18 starts and he worked six or more innings just five times. However, he finished the first half with some hope. Over his final two starts in the first half, he allowed three runs in 14 innings while posting a 14:2 K: BB. In his return after the All-Star Break, he yielded 12 baserunners and lasted just four innings while walking five or more batters for the third time this season. This prompted the Cardinals to send him back to the minors. Weaver came into this season as a potential sleeper after going 7-2 with a 3.88 ERA with a 72:17 K: BB ratio across 60.1 innings last season. Unfortunately, he has yet to live up to expectations of the Cardinals and fantasy owners. The Cardinals have been besieged by injuries to their rotation with Carlos Martinez and Michael Wacha and of course, Alex Reyes missing time so far this season. However, the Cardinals continue to bring up pitchers to ease the burden to the back end of their rotation. Daniel Poncedeleon just made his MLB debut and took a no-hitter into the seventh inning. Lefty Austin Gomber made his debut on Tuesday and went six innings while giving up two earned runs on two hits while striking out six. The Cardinals will continue to support a solid staff especially with the return of Martinez and Wacha. You add the young arms to Miles Mikolas and Jack Flaherty, where does that leave Luke Weaver? Yes, you guessed it. NOT on your fantasy roster.